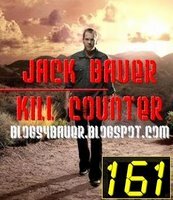 Did I watch '24'? Yes? Did I give my full attention to '24'? Not really. I’ve been pre-occupied. First, I’ve been living in the kitchen for the last few days. 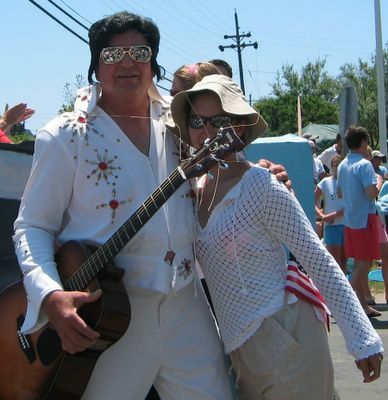 Second, my mother in law just returned from Orlando hunting for places to retire. She called right in the middle of ‘24’ and I lost my momentum. Third, Z-girl caught a cold, aka kennel cough. So now aside from her allergies that have led to dermatitis, an ear infection and an eye infection, she has this hacking cough that makes her sound like she’s weaning herself off of a pack a day addiction. It started off on Saturday with non stop reverse sneezes. A reverse sneeze sounds like the dog has something in his/her throat. Then it started sounding like she swallowed one of her hedgehog toys. The sound can only be described as a low honking sound, like a goose. Then on Sunday it was non-stop coughing like she had phlegm. So now she’s on Triaminic Cough and Sore Throat formula. You’d think she’d like the grape flavor but apparently she doesn’t. We’re back to the dropper method. I thought pooches were supposed to be cheaper than children but Z-girl’s medical costs keep climbing. P-man is voluntarily staying away from her for good reason. The allergies aren’t contagious but the kennel cough is. She has approximately 5 more days before it should completely leave her system. Funny thing is she had her vaccinations and meds when she was younger. I did some research and found that dogs can catch it again and not just at a kennel. It’s airborne so who knows where she could have picked it up. I’m just thankful P-man didn’t catch it too. I did like the shout out from Dr. House during this week’s 2 part episode. Well done, Dr. House. I knew there was a reason I watch you aside from reveling in your crass interpersonal skills. As for this week’s episode, I felt it was a bit slow moving and predictable. I still don’t know who the Bluetooth baddies are. I’m not sure where Wayne was hiding at Buchanan’s. I’ve all but forgotten about Audrey and Bierko. Chloe has inspired me to buy a taser though and Bill Buchanan is my new ‘24’ sugar daddy. Sorry Heller but now that you’ve gone bye bye, I need to move on. Last question, how long have they been listening to Chloe and Karen’s conversations? Who clued them in? Tell Miles triggered something with his call to Novick. 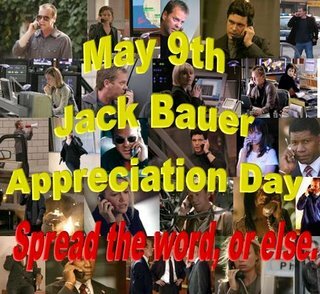 It would figure he would inadvertently lead the Bluetooth baddies to Jack and co.
Next week, we see how the president thinks he could get away with blowing up an international flight filled with diplomats from Germany, France and Great Britain. 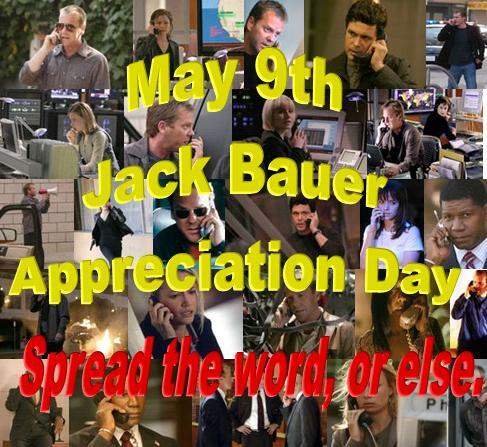 Lastly, Blogs4Bauer reminds everyone that May 9th is Jack Bauer Appreciation Day. Send him a ’Your Day’ Bouquet or pick yourself up a nifty man bag or dark hoodie.